Our plot isn't big enough, and we don't have the time, for us to be self-sufficient in fruit and veg. But it's just wonderful to be able to nip up the garden and grab a lettuce, dig a few potatoes or acquire some green veg such as broad bean tops or rainbow chard. Last night I picked some broad bean tops. 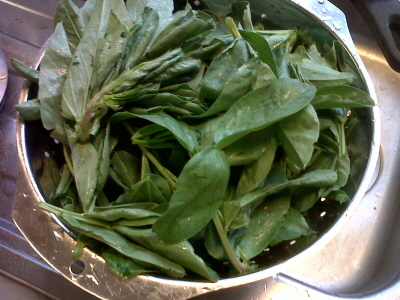 The leafy shoots just above the flowers are really tasty, steamed or cooked in a tiny amount of water like spinach. 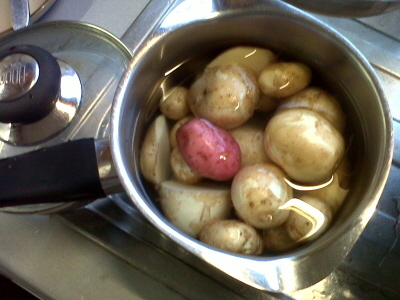 Then I dug up some potatoes which had grown up from tubers overlooked last year. These "feral" potatoes tend to mature a bit earlier than this year's planted crop. They come up wherever we had potatoes last year and, because we practice crop rotation as much as possible, they come up amongst the beans or courgettes or letuces. So it's good to dig them up early and get them out the way. New potatoes, scrubbed and in the pan to boil. Get several potato varieties - but they all taste good! Picking the broad bean tops also helps to prevent black-fly which like to start at the succulent tips and work down. So get in early before they do and enjoy a tasty feast! Some serious rain overnight and this morning. Very welcome because the warm, dry and windy weather has dried the ground completely and the water butts are getting low. We're concerned that the fruit trees will start dropping their little fruits, which this year are abundant on all the trees, and we were on the point of getting out the hose. I see so many of my posts are about weather (about 82 out of 180 mention the weather!). But the weather seriously affects how the garden performs. The temperature, rainfall, and frost can bring forward or delay the seasons. Even sharp changes in weather can affect crops and cause conditions like the potato "Hollow heart". The frost last week, the first week of June, caused serious set-backs to the marrows and squashes and the potatoes - more damage than I thought at first. It's a juggling match, whether to plant out veg that is growing out of it's pots and at risk of getting cooked in the greenhouse or to risk damage from a late frost. It's often difficult to keep track of the weather. We remember the really dramatic weather events but find it hard to get an overall picture of weather and trends. Writing a blog like this can help the memory and allows us to compare weather and results year by year. June has been quite summery and warm so far but with cool nights. Yesterday I planted out 36 French Beans which were raised in pots in the small conservatory. They had started to climb around each other so they needed to be moved on. I added a barrow load of compost to the raised bed and set up 4 "wigwams" using steel poles and bamboo canes (mostly home-grown) and planted out the beans. looking good. Then, locking up at midnight, I realised the temperature was dropping. At that time of night not a lot to do other than hope and pray. This morning I wandered around to inspect possible devastation, but the beans were fine. However, the courgettes at the top of the middle veg bed had definitely been frosted, as had the fuchsia in a pot outside the greenhouse. Not too much damage, but just a warning that here in the East Midlands the weather can turn chilly even in "flaming" June.